My previous attempts at crochet have been… less than successful. I have made a rather gappy Giraffe, a beanie hat that is hilariously far too big (gauge not checked. doh!) and an ‘Ugly Bunny’ pincushion that I lost interest in. It dawned on me that I do not sew a lot and so a pincushion is not really a must-have item at the moment. I should have added something in the piccy for scale. This ‘hat’ could quite comfortably house a family of 4 on a camping trip. Cosy! Having only just begun to learn the processes and techniques involved in crochet, I wanted a project that would suit my beginner status. 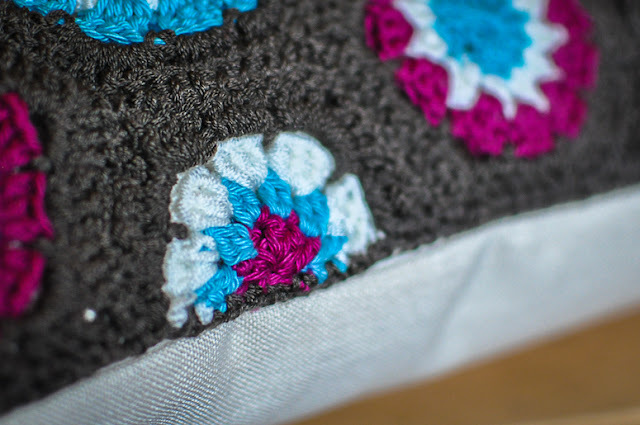 I found this pattern very easy to follow as it is described more like step-by-step instructions, rather than a crochet chart. I have since learned how to read charts, but to the novice they can be an intimidating jumble of letters and numbers! Dull as it may become, repetition seems to be the key for me when learning new skills. Sure, I could probably fluke a one-off hat or amigurumi piece, but I wouldn’t be able to do it again without re-learning the steps. 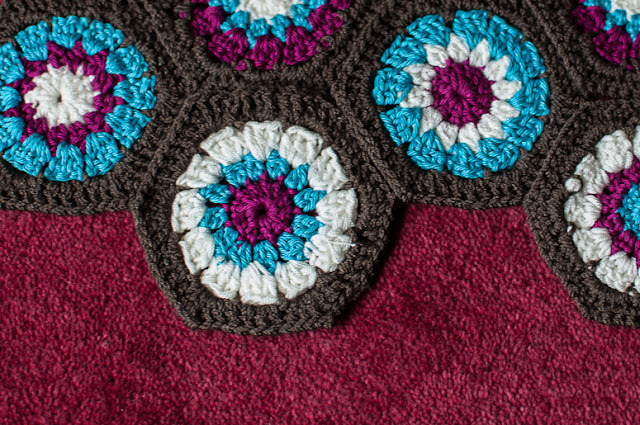 I decided a hexagon blanket would be perfect as it is all made up of small pieces and so would keep my attention and would also be easy to put down and pick up when I feel like it. This one was obvious. If I was going to invest so much of my time on a project I would have to love the outcome. The colours and design would have to be perfect in order to take pride-of place in our living room. So… With all of this in mind, I settled on the blanket. I trotted down to the local discount shop and selected my yarn. I chose some beautiful shades of Chocolate, Cream, Turquoise and Dark Magenta. The perfect colours for our space. Just out of shot: all the mess! This must be the tidiest corner of our house. Twenty-odd hexagons later, and something was beginning to become apparent. I was going to need more yarn. Having only worked on small projects before, I honestly had not anticipated the volume of yarn needed for a project like this! This was my mistake. And wow did I pay for it! OK. Lesson well and truly learned! With a heavy heart, I realised that this pile of loose hexagons was now never going to become a blanket suitable for any adult human. I purchased a couple of neutral coloured cushions from Wilkos (no expense spared!) and pinned the hexagons in place over and over and over again until the pattern was exactly how I wanted it. Only three more hexagons needed. Hoorah! I was quite pleased to find that once all the hexagons were arranged I only had to make u a few more colour variations to fill in the pattern gaps. I had more than enough yarn left for that. Hoorah! All pinned in place. Starting to get exciting now! Chain 3 and join to make loop. Chain 3 (in place of first tr) and then tr 5 times into loop. Turn. In new colour, chain 3 into first st (to act as 1st tr) then tr 2 into first bobble space. ch1 and tr 3 times into each bobble space. Turn. In new colour, ch 3 and sl st into each ch1 gap of previous round. Turn. I could now see the finish line. It was so close! I grabbed my darning needle and started to sew the little hexagons together as quickly as I could. Seeing the design start to pull together was very, very exciting. ‘ it a little every now and then. I believe sewing pros may call this ‘easing in’. it didn’t take much to get it looking perfect. And then… It. Was. DONE! I toyed with the idea of adding pom-poms along the edge. But decided against it as, to me, it was perfect already! 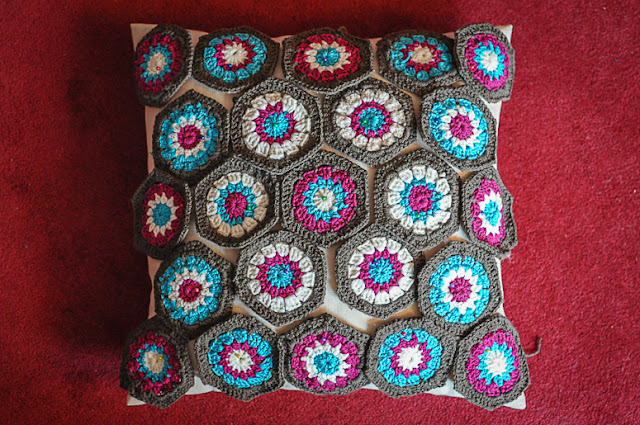 I love my granny hexagon cushion so much. every time I look at it I have to smile a little. I do have to keep poking in the yarn ends that continue to try and escape, but I guess tat is the charm of Handmade. 3. A large project made up of smaller component pieces is perfect for a beginner who wants to end up with something impressive. After all, it’s always nice to create something that can be admired all year long. You certainly can’t do that with another big beanie! 4.If all else fails, a good old pen and paper can get your ideas straight and move you forward from a stand-still. Once I had decided on a cushion I broke out the trusty notepad and drew out my design. Things in our house inevitably end up getting dumped on the floor and so this way I would never lose or forget the design I had settled on. It also helped to get the symmetry right in the pattern AND now I also have a guide for any future incarnations of the same cushion. 5. If a project goes wrong or starts to get you down there is absolutely no shame in taking a break or even starting something new. Nobody is chasing you and there is no point spending your hard-earned free time stressing out over a pile of wool. Enjoy what you do, or don’t do it! What happened next? Well I went online and purchased A LOT of yarn in similar colours ready to take another swing at a blanket. (details to follow in future post. Needless to say I have found a GEM of a yarn supplier) I may try a different pattern this time though. I’m feeling adventurous. I’d love to hear from you if you got yourself into a situation similar to this while starting out in the world of crochet. If you would have approached the set-back differently, what would you have done?. Get in touch! 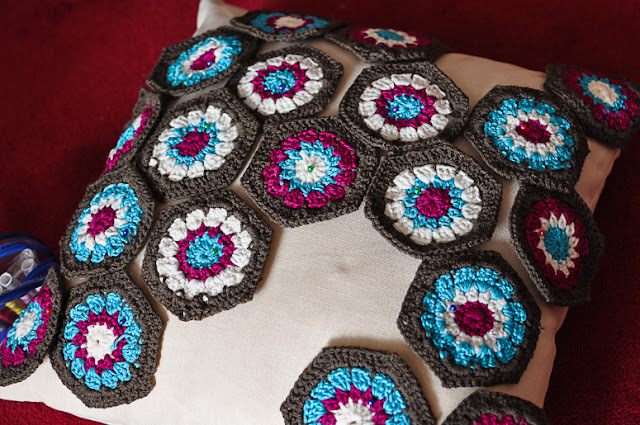 Attic 24 – The inspiration for this project and original creator of the pattern shown throughout this post. 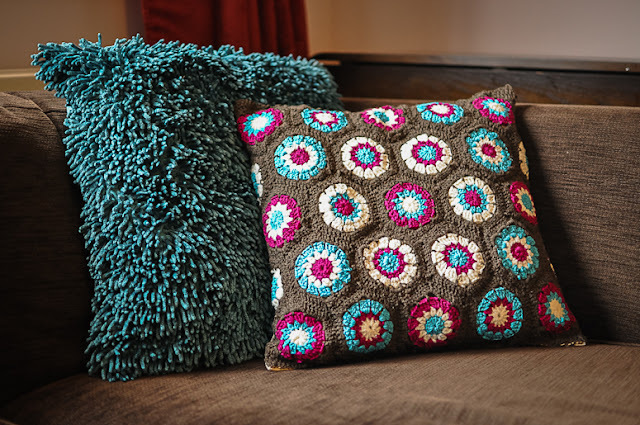 Pinterest – A great source of inspiration when it comes to crochet designs and ideas. 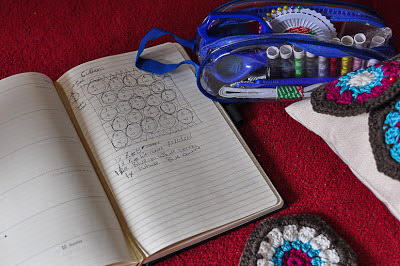 Ravelry – My fave place for patterns. A huge library of both free and Paid for patterns. 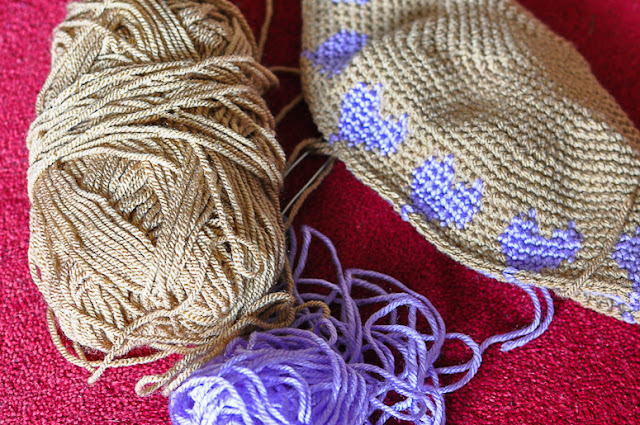 Knitting and crochet. 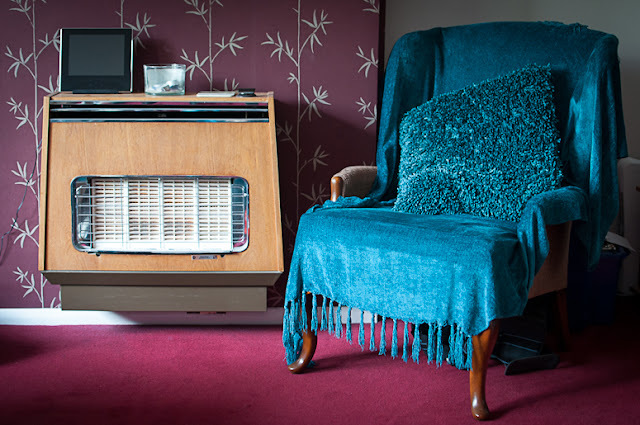 DIY Heated Faux-Fur Blanket. Make your own and save some cash! Dried Lavender: 5 Creative Uses to Brighten up your Life!